First a curry recipe and now this. Thai? What right do I have to be posting such recipes? Disclaimer: I have no experience with Thai cooking nor do I boast any culinary training in said field. Nope. I’m just your average white chick who has an addiction to the heat that this kind of food brings. I can’t get enough of it. And I can’t always drive to Indianapolis to get my fix. After trial and error and determination and maybe a pinch of obsession, I’ve created a satisfactory substitute that I can make at home. 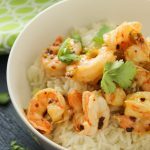 Like any good Thai dish, these shrimp are layered with intense flavor – sour lime juice, honey, hot chili flakes, savory green onion, and fresh ginger. Once they’re seared to tender perfection and coated in a sticky-sweet spicy glaze, there’s bound to be a party in your mouth. This super simple marinade and my trusty cast-iron skillet make it easy to recreate Thai restaurant magic in my own kitchen. I actually see no reason to ever leave the house again. The best part? From start to finish, the meal is on your plate in under 30 minutes and you don’t have to waste any more time searching Yelp for the best Thai joint in the tri-state area. 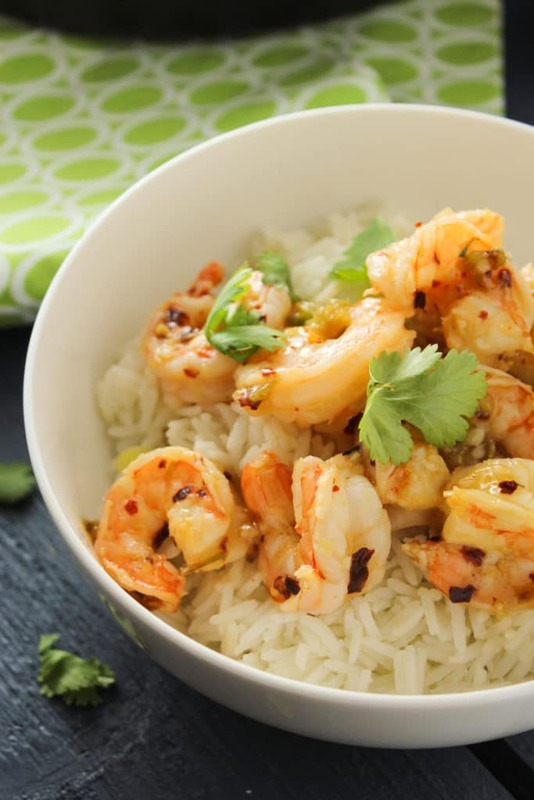 Get your rice cooking while you prep the ingredients and before you know it, you’ll be sitting down to a home-cooked version of Thai food that beats anything you could’ve ordered in. 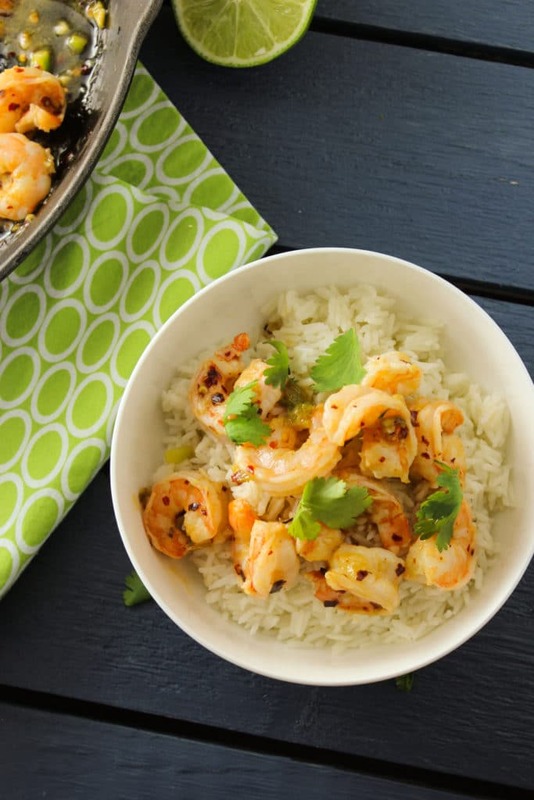 Thanks to a simple marinade and a quick toss in a skillet, these shrimp are seared to tender perfection and coated in a sticky-sweet spicy sauce. Mix ingredients for the marinade in a large bowl. Add shrimp and toss to coat. If desired, allow to marinate in refrigerator for up to 4 hours. 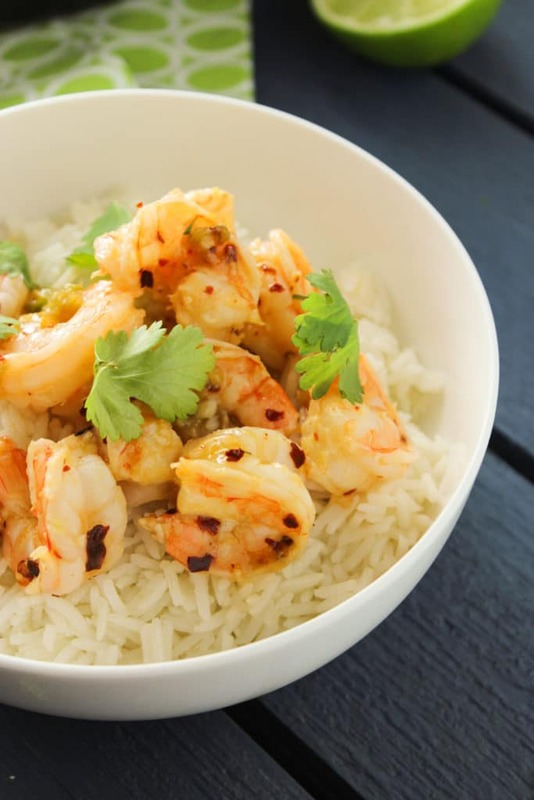 It’s not necessary, but obviously the shrimp will be more saturated with the marinade. Heat 2 tablespoons of oil on medium in a large cast iron skillet [wok or non-stick skillets will work, too]. Add green onion and sauté until soft. Add shrimp and cook for 4-6 minutes until shrimp are cooked through. They should look white and start to curl up. Don’t overcook – they will become rubbery and tough. Yum! You put together the whole package! 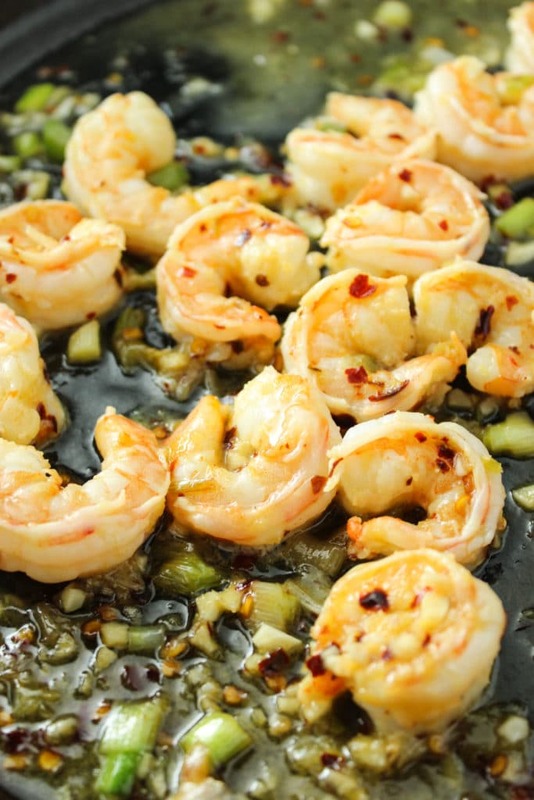 I’m so glad you enjoyed the shrimp – thank you for commenting!